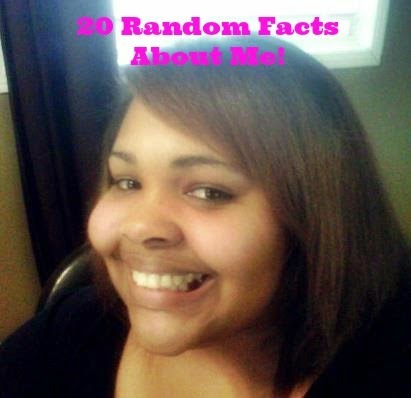 So here I am ready to share with you all 20 random facts about myself, Me, LaQuita, creator and main blogger of Just Us Girls. Here goes nothing! 1. I was born and raised in California. 2. Met my Canadian hubby in California, fell in love, got married and moved to Canada, where we currently live. 3. I'm the second oldest of eight kids. 5. My favorite color is Purple, but I never wear it. 6. I always say my favorite food is lasagna, but I'd take tacos, burritos and enchiladas over it any day of the week. 7. I love to hosts social parties for any and every occasion. 8. My all time favorite boy band growing up was N'Sync, now my favorite artist is Justin Timberlake. 9. All time favorite movie will forever be Pretty Woman. 10. I despise Mayo, but will eat my parent's potato salad and tuna salad. I know weird. My hubby has tried to get me to eat it for years now. 11. My favorite series of book is currently The Watersong Series by Amanda Hocking. If you haven't read any of them, get on it, it's worth it! 13. I come from a huge family. My mom has 12 siblings and my dad has 5. 14. I'm a lover of wine and Skinnygirl cocktails. 15. At age 13 my mom gave me a surprise birthday party. It worked and I was shocked and then she kept throwing them for the next three years, lol. 16. I've worked from home as a transcriber for the last eight years. 17. In order for me to enjoy a bubble bath I have to first take a shower so that I'm clean, lol. 18. My kids can make me laugh more than most people. 19. I love dancing, but think I'm horrible at it. 20. I some times say things without speaking, which my husband always makes fun of me for. I've told him to make a twitter for Sh*t My Wife Says, but it's already taken, lol. I hope you all enjoyed my 20 random facts! I plan on doing more posts like this soon!